With more than 200 million daily users, Google Translate is undoubtedly a trustworthy multilingual machine translation. The incredible translator helps you to translate text, words, and articles from one language into another. Moreover, it is the best way to enhance your knowledge and vocabulary in foreign language. However, apart from Google Translate, there are tons of other software available in the market. 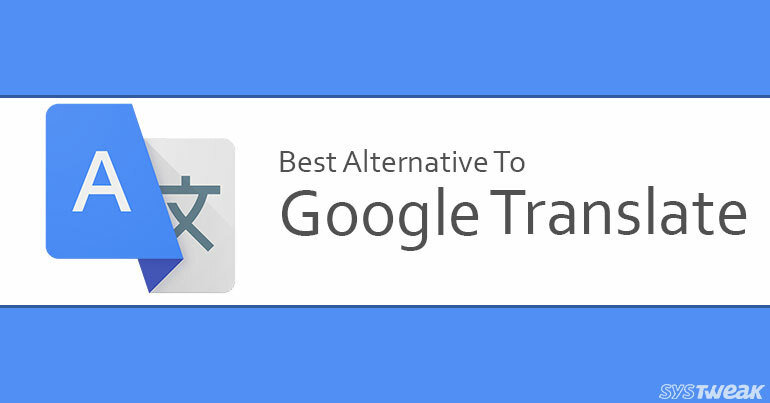 To save you from the distress of looking for the best one, we’ve rounded up 5 best alternatives to Google Translate. So, here we go! Platform: Windows, Android and iOS. Microsoft Translator is a smart and personal translation app developed by Microsoft for both personal and business purposes. It helps you translate your photos, screenshots, texts, and voice messages. Microsoft Translator is an offline translation tool that comes handy for those who travel across the globe. To utilize the most of it, you can save & pin the frequent search results to use them for later. It is very precise for Bing, Internet Explorer, Skype, Yammer, SharePoint, Twitter, WeChat and many more. Microsoft Translator comes in 60+ languages. The tool also supports Android wear smartwatch to give quick response for translation. Moreover, you can share the information with other apps as well. Platform: Windows, Android, Mac, and iOS. Babylon is considered as one of the world’s leading providers of dictionary and translation tools that contains a selection of 1,700 glossaries and dictionaries in dozens of languages. It has almost 19 years of experience and capable of providing accurate results in thesaurus and dictionaries. Babylon Translator is available in over 77 languages including English and Dutch. As you can use the program offline, you do not need to have an Internet connection to access Babylon Translator. If you’re an Android user, you can download the Android app that is rated 4.2 stars. Indeed, it is one of the best alternative to Google Translate. Platform: Windows, iOS and Android. It is an incredible and intuitive software, which has been developed by Softissimo Inc. Reverso Translation is rated 4.6 stars and trusted by more than 6 million users. You can easily learn and translate words and expressions with Reverso Translation in real time. The tool helps you understand the word with real-life examples and you can check the pronunciation and phrasebook. It is free, powerful and useful software, which not only lets you translate the words without Internet connection but also allows you to check search history to go through the same info again. You will get suggestions and alternatives of every word you type in the search box to increase your vocabulary. It is available in multiple languages such as English, French, German, Spanish, Polish, Hebrew, Italian, Arabic, Portuguese, Russian and Dutch. In fact, you can share your searched info with others via email, Twitter, Facebook, etc. It is a web service that helps you translate a single word or sentence instead of paragraph. Like other language translation software, you can also use it offline or when you have a poor Internet connection. Linguee gives an opportunity to enhance your knowledge and experience the joy of knowing a new language. Linguee has searched more than millions of reliable translations. With the help of Linguee software, you can simply discover new cultures, trends, phrases easier than ever before. Isn’t it exciting? Like other software, it is also available in multiple languages for example French, German and Spanish. Last but not the least, iTranslate helps you to translate anything just by start voice conversations or looking words. In other words, it allows you to translate anything by typing a text or voice-to-voice conversations. Like other tools, you can use it offline which means you do not need any Internet connection. You can easily avoid roaming charges at the time of travelling in other countries. It is a simple and straightforward software, which is easy to use for any age group to give comfort when you are in another country. Itranslate is available in more than 90 different language. So, these are the 5 best alternatives to Google Translate you can rely on. Surely, they will help your conversations in a different language easier for you. Let us know what do you think about them, in the comments.